Lush Cosmetics - Admit it other than the Lush face masks which are a personal favourite of mine, the majority of us pop into Lush and get side tracked by the bath bombs and general bath treats? Yeah me too but next time your are in store, pop over to the skin care section and try out a few of their products. I personally swear by Lush Ultrabland Cleanser which is a great alternative to Emma Hardie Moringa Cleansing Balm. Another product I fully recommend is the brands mist on toners, they are so gentle, well priced and last forever. Oh and the vast majority of Lush skin care is under £10. Well worth checking out if you ask me. Boots Botanicals - Maybe not lesser known as such but most likely a brand we have all overlooked? Well I truly think it is up there with Boots No.7 brand especially if you like skin oils and balm cleansers. Again it is a really well priced line and often on offer - Boots famous 3 for 2 offers can not be beaten. My person hero items from Boots Botanicals are the Boots Botanics Organic Facial Oil - a great evening oil to restore dried out skin without being greasy and of course the Botanics 97% Organic Hot Cloth Cleansing Balm. This was the first cleansing balm I ever used and still rate it rather highly, it is gentle and cleanses efficiently without costing the earth! Soap and Glory Skin Care - This is the brand I am most guilty of forgetting that they have a stellar skin care line up as well as make-up, bath and body products and a onesie for the upcoming festive season. Basically you name it Soap and Glory do it. I rather enjoy Soap and Glory's cleansers and face masks, they tend to really remove the gunk (what a beautiful, technical term) from my pores with such ease. Again a great brand to stock up on when in Boots - hello Advantage Points and again the sale promotions. Oskia - One of my more pricey suggestions but one brand worth every penny. I have spoken countless times about the Oskia Renaissance Cleasing Gel and would deem it to be my holy grail cleanser. Well only if you twisted my arm as I do like a lot and I mean a lot of cleansers. Oskia is brand that relies on both science, bio-available vitamins and fruit enzymes to create unique formulations, the majority of which brighten and renew. I have fairly sensitive skin and have never reacted adversely. As mentioned this is a slightly more pricey brand but a little goes a long, long way. I have only bought two bottles of the Oskia Renaissance Cleasing Gel in the last year and I use it daily, sometimes twice a day. Yonka - Hands up who has used Yonka Pamplemousse? My guess is quite a few? As great as such moisturiser is, there is so much more to the brand which happens to be one of the lesser spoken about French skin care brands. 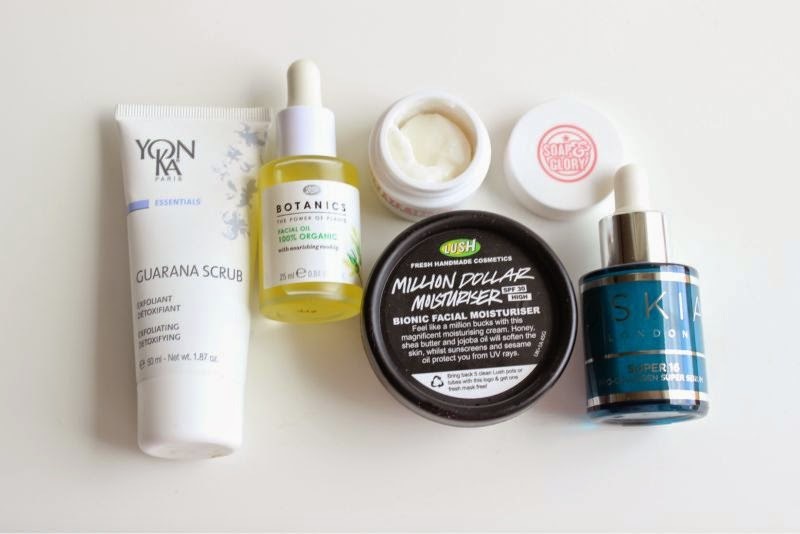 Each item (in my opinion) within the range does more than your typical skin care product. For example the face scrub doesn't just exfoliate but can double up as deep cleansing mask, the moisturisers all re-balance the skin and generally live up to the French skin care hype. I love LUSH and Soap & Glory. However for LUSH I tend to stick to their bath bombs than their skincare! I have sensitive skin and unfortunately Boots Botanics irritates my face, I say unfortunately because I know other people rave about it! I come out with huge red sore patches when I use their products :( sorry I deleted my last comment, spelling error! I love myself a bit of Lush skincare, it really isn't talked about as much as their bath & body products I always feel which is a shame because they are some real gems. I've used a few of Lush's masks but never the actual skincare, something I've always wanted to try though along with Nip+Fab. Heard so many raved reviews about Nip+Fab! Thanks for the post, currently looking for some new skincare! Boots Botanics used to be excellent products and good value. Then they reformulated their entire range in the past year or so - I don't know what they did but absolutely none of it is suitable for sensitive skin, at all - the old versions were much better. I'm afraid I wouldn't recommend any of it now. Lush, on the other hand, have stepped up their game massively with skincare in recent years, and are now producing some really great products. Definitely second their toners - all great, especially the tea tree version. Hi! I've been on the search for the perfect moisturiser but never thought of looking in Lush! Silly me! Will definitely have to drag myself away from the bath bombs for long enough to try some next time I'm there! Thanks for recommending! I love Soap & Glory skincare! I've been meaning to try some Lush skincare for a while now! I also really like the Ultrabland cleanser from LUSH and their mists are fab too. Botanics is a brand that I've tried a few bits from now and I've loved everything so far!